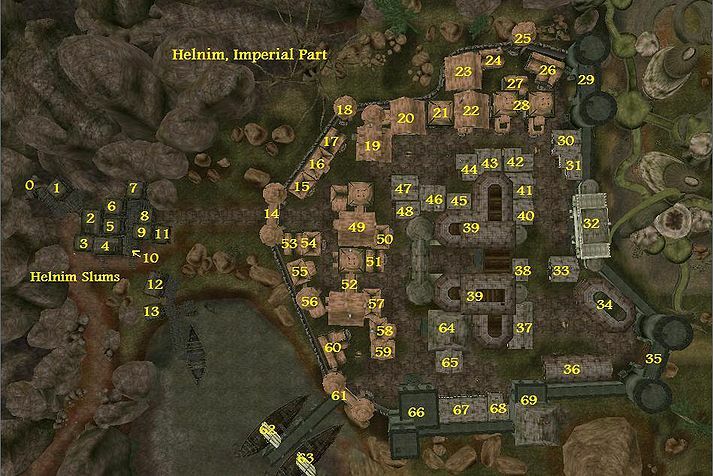 Helnim is the second largest city of the Empire in the Telvannis District. However, due to its position of minor importance and influence in the Inner Sea, compared to the bastion of Firewatch, it is a far less fortified city, and has fallen into disrepute. 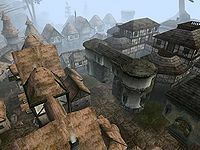 The malignant Telvanni influence of Tel Narrusa, and the incompetence of local governor Contumious Flavius have brought the city precariously near to breakdown. At the center of the town lies grand Helnim Hall, a fine abode for a less than exemplary gentleman. Here resides the governor, and his entourage of servants, guards and family. The governor can usually be found dining in his chambers, while his steward greets visitors in the main hall. Surrounding Helnim Hall is the residential district of Helnim. Many residents are crammed into the narrow city streets, but the town is famed for its wide variety of stores and traders. The famous Helnim Market is also an attraction to the interested visitor. If you wish to spend the night, or have a meal, there are three taverns to choose from: the respected Crystal Flower Inn, The Red Drake Inn (rumored to be the favorite joint of some 'interesting' patrons) and Mjornir's Alehouse. On the far side of town lies the Census and Excise office, placed in an offhand manner seemingly designed simply to make city bureaucracy take that much longer. A small encampment of slums has long existed to the west of Helnim, populated largely by miners and ne'er-do-wells. Its presence is a testament to the status of the town at large. Outside the town to the northeast lies Tel Narrusa, tower of the "Mad Lord of Helnim", Narrusa Darythi. Telvanni services can be found here, while the Mad Lord remains permanently in his chambers. Those wishing to do House business should speak to Vyhlathri Ashara, his right-hand man. Helnim maintains regular boat travel lines with Firewatch and Marog, while Tel Narrusa competes by offering silt strider connections with Ranyon-ruhn and Tel Muthada. By foot, a long and winding road crawls to the north around the Boethian Mountains until a pass where it can cross them to reach the road between Ranyon-ruhn and Firewatch. To the south, it cuts through the Helnim Fields to rejoin Tel Muthada or Marog. Governor Contumious Flavius is the designated Imperial authority in Helnim, but in reality this is not how the town works. The governor is in fact more a hindrance than a help to Imperial authority in Helnim. His Telvanni counterpart is the Mad Lord, Narrusa Darythi, who makes no more of an effective ruler for the Telvanni. For the Imperials, true power lies with the newly promoted Knight Protector Caedan Jorval, who has organized a town militia independent of the corrupt Windmoth Legion, who still officially garrison the town. With the Telvanni, power is shared among a small 'council' of Narrusa's closest advisers, headed by the adept Vyhlathri Ashara. Outside of politics, other notable figures are local Fighters Guild head, Hartise and the head of the Imperial Archaeological Society's Helnim branch, Barrato Marthus. An important thing to note about Helnim is that, despite its high levels of corruption, the arrival of Caedan Jorval led to a sharp clamp-down on Thieves Guild activity. For this reason, the local boss, Greedy Hofmund, is requiring all Guild members to keep a low profile, if they haven't been arrested already. Imperial Cult services are led by Cantorius Tramel, and Census and Excise work is carried out by Vara Solius, or Jociel Marinard in the diamond mines. 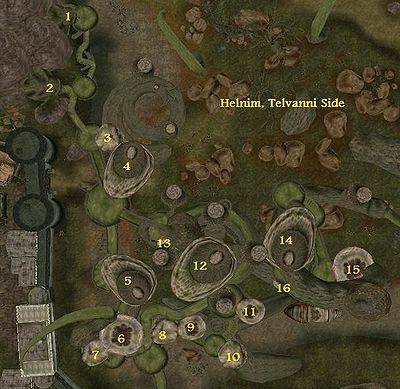 For a complete list of all the people in Helnim, go here. The most notable place of interest in the area is incontestably the cyclopean ruins of Kemel-Ze, just across the bay. In closer vicinity, the caves of Asnadan, Berantus and Galseah can be found; as well as the Falanos Tomb. 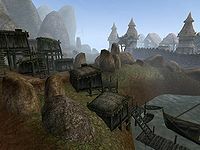 Farther to the south lies the Veralan Farm and to the north can be found Otori and Yenidan, two caverns, the Aviroth Ancestral Tomb, the Dwemer Ruins of Mzankh, the Velothi Tower of Assurbalhet, and the famous Telvanni Library. To the southeast, the Dwemer ruins of Amthuandz form with Mzankh and Kemel-Ze a triangle of which Helnim is roughly at the center. Tainted Goods: Make sure a fellow guild member is not in peril. Mission of Mercy: Knock some sense into a Redguard miner. Tainted Goods Revisited: Discover the source of cursed supplies in Helnim. The Mad Lord's Guars: Help take care of some guars in Helnim Fields. Hunting Twilight: Kill the summoned winged twilight Guuljhka and retrieve the summoner's lost staff. Aid the Sick: Help the cult deal with a sickness. The Healer's Library: Retrieve a book for a healer. The Wealthy Widower: Console a grieving widower. The Fearful Foreigner: Collect the dues of an unlikely convert. The Thieving Pilgrim: Help retrieve a stolen limeware platter. A Symbol of Hope: Find the legendary blade. Test of Loyalty: Unearth a mole in the organisation. Uncovering the Truth: Meet with a militia double-agent. A Fourth Thief: Bring an ex-guildmember back into the fold. Anonymous Request: Not everything is as simple as it seems. A Midnight Meeting: Spy on a secret meeting of the Helnim Militia. Complicated Competition: Assist a healer with a business problem. Deep Conversation: Deliver a letter to a distant son. Dwemer Dealings: Assist a smuggler with his operation. A Learned Reader: Find a new book for an avid reader. Literary Critic: Help track down a lost book shipment. Mundane Errands: Deliver some messages for the local jeweler. Observing Prospects: Find out about a local man's personality. A Special Treat: Help a cook with his baking. An Unexpected Visit: Help track down an old friend. This page was last modified on 6 March 2019, at 07:52.